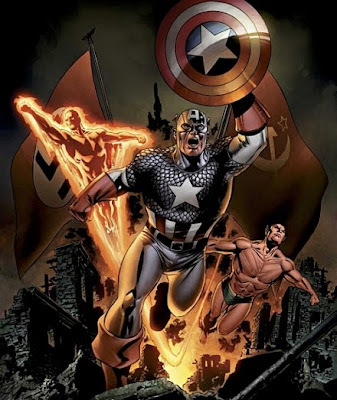 Even the news that David Goyer is working on a script for BATMAN 3 can't halt the onslaught of news revolving around The First Avenger: Captain America. Director Joe Johnston, having just polished off The Wolfman, is now steaming full speed ahead into hyping the film adaptation of Marvel's shield-slinger, stating to CHUD the allied forces super-hero strike-force; The Invaders will be in "the entire second half of the movie". No word on who the six members involved will be, but here's hoping for Bucky, Union Jack and the Human Torch! The next challenge Joe told the LA Times he wants to confront - how a soldier takes to wearing a bright walking flag in the heat of World War ll. The answer - make him a reluctant performer with United Services Organizations, in the style of the late Bob Hope. "So he's up on stage doing songs and dances with chorus girls and he can't wait to get out and really fight. When he does go AWOL, he covers up the suit but then, after a few things happen, he realizes that this uniform allows him to lead. By then, he's become a star in the public mind and a symbol. The guys get behind him because he embodies something special." Johnston who also directed pulp-fiction period piece The Rocketeer, says the costume will mutate as the film progresses, from the classic Jack Kirby design, to a more custom-made battle ready getup. The title role for Steve Rogers will be signed before March 1st, with filming starting in London before the end of June.